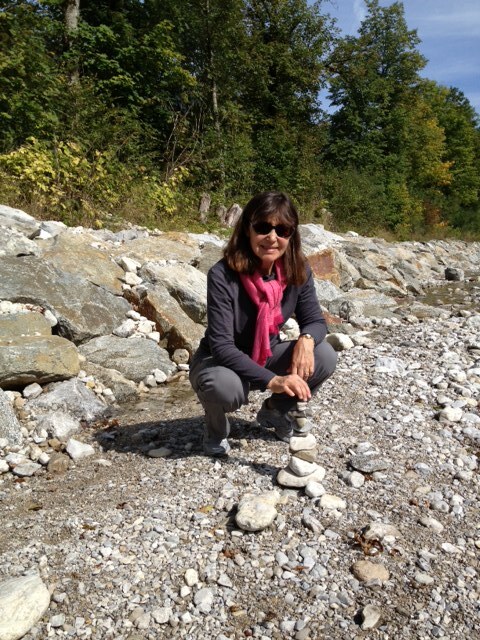 Marking a special place in the Austrian Alps. Claudia Suzan Carley travels as often as possible, both to discover new places and to revisit old favorites. Her main travel interests are art, architecture, literature and history. At home in the Colorado Rockies, her passions include swimming, biking, walking, and snowboarding. She has always been an occasional painter, and has recently begun painting seriously. Her favorite way to see a new place is on her feet, up close to the sights, smells, tastes and sounds. Photos are mostly taken with her trusty iPhone. Other photos are compliments of her husband, who cheerfully drives anywhere and always lets her have the window seat on a plane. Just discovered your blog. Do you plan your own trips, or do you use tour operator? I’d love to take a trip focused on Castles and Coffeehouses. If you travel with a group, how can I sign up? Thank you for your interest! I’m an independent traveler. But maybe I should try a group tour! I would recommend looking at Rick Steves tours. I know a lot of people who have been delighted with Rick Steves tours. I always use his books when planning a trip, especially to a place where I’ve never been. But I do a lot of reading and belong to several Facebook groups such as British Medieval History and European Women in History. The more I learn, the more places I want to visit. As a lover of history, travel, and photography, I am excited to have stumbled across your blog. I have travelled to 14 different countries and have a bucket list of others I want to see. Like you, I am an independent traveller. I enjoy the challenge of finding great little places to stay and in discovering hidden gems that are not often covered on tours. Great blog and wonderful photos. Deb, thank you for your comment! I’ve sent you a private reply also (I think). I try to post 2 or 3 times a week, but I’ve recently had some health issues. Now all is well and I’m hoping to make up for lost time. I’d love to hear about your travels and interests. If you have a blog, I’d love to follow it! Claudia,your blog is really amazing! I”ve just spent couple of hours reading it and time just flew by 🙂 If you ever wish to visit my country,Croatia, I would be more than happy to be your guide. I have a travel agency speciallized in culture tourism, my wish is to reveal to the world all the cultural heritage richness that Croatia has. Hope we”ll be in touch,wish you all the best! Thank you for your very kind words, Nikola! I have neglected my blog a little lately, partly because of technical difficulties with a new computer. Your words give me motivation! I would love to visit your beautiful country and I’m sure I will. Claudia, I’ve followed your blog since 2015. I am planning my first trip to Europe. I’ve enjoyed your blog and photos so much. You are such an inspiration! I will be traveling with friends for two weeks, then on my own for 6 days. Arriving in Paris, then Honfleur, Dublin, Glasgow, Malta, Sicily, Lisbon, Sentra. In two weeks. There was a miscommunication on when they were returning, and it will cost me $300 to change my return flight. I will be leaving them in Portugal on Oct. 6 and flying home from Paris on Oct. 13. Do you have any advice on places to see, stay, go, avoid? I would like to spend two days in Paris, but was thinking about Spain or Italy for the interim of Oct. 6-10. Any help you give will be appreciated. Thank you for reading, Vicki! I am going to email you. I’ve been traveling almost too much the last few months–time to catch up on posting. It is so nice to hear from a reader! You have a wonderful trip planned at a perfect time of the year for traveling. Claudia, as a personal friend, I’m delighted to see your posts and so proud of you! Your photos are inspiring.